In a major coup for the Vanuatu Rugby League (VRL), Rugby League legend Mal Meninga will attend the Port Vila 9’s on Saturday 13th April, 2013. Meninga as a guest speaker at a Charity Sports Luncheon held by the Carbine Club of Vanuatu along with netball great Vicki Wilson. Meninga has close ties to Vanuatu, with his ancestry tracing back to Tanna Island. Meninga’s nephew, Joey Meninga has played for Vanuatu both in 9’s and started in the second row for last October’s highly successful Test Match vs Greece. Meninga is best known as a goal-kicking centre and regarded as one of the finest players of the 20th century having been selected in both the Queensland and Australian Teams of the Century. Meninga began his career in the Queensland Cup with Souths Logan Magpies, the same club as current Vanuatu player Ben Henaway where he won two Premierships before playing in England with St.Helens where he also won a Premiership. 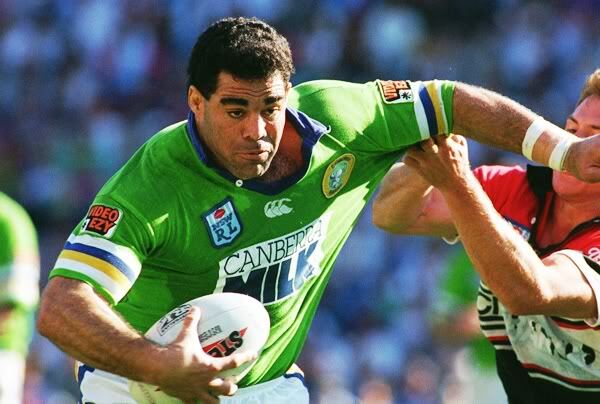 Meninga is best remembered for his time in the NRL where he played 166 games for the Canberra Raiders, captaining them to three Premierships and five Grand Final appearances. Meninga also played 32 games for Queensland (9 as captain) which included numerous series victories and 46 games for Australia (23 as captain) including winning the 1992 World Cup. Following retirement in 1994, Meninga coached the Canberra Raiders for five seasons. Meninga is the current coach of the Queensland State of Origin teams where he has won the last seven series in a row, aiming for an eight in 2013. Meninga is also the High Performance Director for the Papua New Guinea Kumuls leading into this year’s World Cup in England at the end of the year. Justin O’Neill’s Melbourne Storm remained undefeated with a 32-26 victory over the Brisbane Broncos. O’Neill is expected back in four weeks. Younger brother Samsen O’Neill’s started on the wing for North Queensland Cowboys U/20 side that was defeated by the New Zealand Warriors 25-6 in Auckland on Monday, in a match televised by Fox Sports. O’Neill ran 8 times for 81 metres, including 2 tackle breaks and made 8 tackles. O’Neill has been selected to start on the wing for the Cowboys U/20’s clash with the Penrith Panthers on Saturday night at 1300Smiles Stadium (Townsville, Australia) with kick off at 4:15pm (5:15pm Vanuatu time. Alehana Mara’s Auckland Vulcans drew 24 all with the Windsor Wolves. Mara remains sidelined with an ankle injury. In his first television game of 2013 Jarvan White starred as his Ipswitch Jets defeated the Easts Tiger 28-10 in Brisbane on Sunday. On Saturday Ben Henaway’s Souths Logan Magpies were defeated 50-16 by the Northern Pride in Cairns. Vanuatu Captain James Woods Tweed Head Seagulls were comprehensively beaten 24-0 by the Redcliffe Dolphins in Brisbane on Sunday. Woods will start in the centres in the Seagulls clash with the Northern Pride at Innisfail (Innisfail, Australia) on Saturday at 7pm (8pm Vanuatu time). White will start at fullback in the Jets clash with the Wynnum Manly Seagulls at BMD Kougari Oval (Brisbane, Australia) on Sunday at 2pm (3pm Vanuatu time). Henaway will start at fullback for the Magpies clash with the Sunshine Coast Sea Eagles at Davies Park (Brisbane, Australia) on Sunday at 2pm (3pm Vanuatu time). The match will be shown LIVE on Channel 9 Queensland. In regional leagues throughout Queensland, there were no games over the weekend due to the Easter break. In other news Patrick August is in high spirits as he awaits an operation after suffering a season ending knee injury playing for Souths Mackay two weeks ago. This entry was posted in Uncategorized on April 5, 2013 by Vanuaturl.